Sometimes when moving into your home, you probably saw a better look and feel for each room and wondered how to go about calculating remodeling costs. Let’s say you would like remodeling budgets for a garage converted into an office, the bathroom updated with new lighting and cabinetry, the kitchen transformed with an open concept and all-new appliances. It’s easy to imagine. But, when it comes down to the nuts and bolts, how much will these renovations cost? And which features can you budget for right now? CAD Pro helps you plan and complete any type of remodeling plans with intuitive smart floor plan tools and remodeling design symbols. Share your remodeling budgets and plans with clients or professional remodeling contractors using Dropbox®, Google Drive™, OneDrive®, and SharePoint®. Export files to Microsoft Word®, Excel®, and PowerPoint® with a single click. See what you can achieve with these modest, average and luxury remodeling budgets. Most people have a unique vision of their “dream” kitchen, but not everyone can afford it right off the bat. Homeowners tend to spend $13,000 to $35,000 to match their kitchens to their lifestyles. Modest – With $5,000, you must set your priorities in order to maximize your efficiency and calculating remodeling costs. You can either reface or finish the cabinetry, upgrade your countertops or get all-new appliances. Any one of these will have a significant visual impact, and you may still have room in your budget for detail work like painting, new plumbing fixtures and lighting. Average – With $20,000, you can upgrade multiple aspects of your kitchen. You can paint, get new countertops, reface or replace your cabinets, and invest in high-quality appliances. You can also add a kitchen island or remove a wall to open your space. Note that removing a load-bearing wall could soak up over $10,000 of your budget, so be sure to consult a professional before attempting this. Luxury – For the luxury kitchen of your dreams, your kitchen remodeling budgets will probably exceed $35,000. With this, you can change the layout, knock out a wall, install new windows, get high-end materials for flooring and countertops, and update to the latest and greatest appliances. For an extensive remodel like this, you should definitely consider hiring a professional designer. 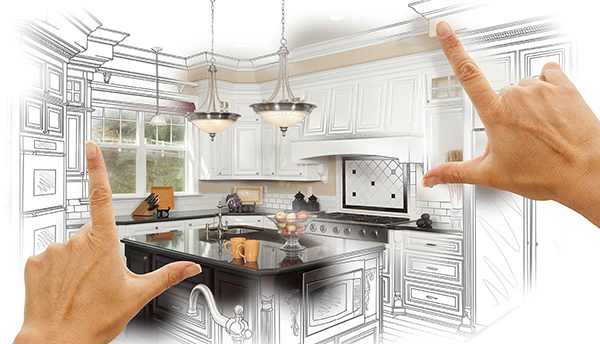 When calculating remodeling costs on a luxury kitchen remodel, it’s highly advised you create a set of detailed remodeling plans and a cost of materials. A bathroom remodeling project can be as big or small as you need to make the difference you want. On average, homeowners spend $5,000-$15,000 depending on the size of their bathroom and the extent of the remodeling budgets. Modest – With a budget of around $2,800, you can bring an outdated bathroom into the 21st century. Give it a fresh, inspiring coat of paint; upgrade the toilet and the sink; and add intentional décor to boost character. And while you’re at it, update the lighting. Average – For closer to $10,000, you can swap out every surface and fixture if you don’t move plumbing or electrical. This budget will typically get you new cabinetry, flooring and countertop materials and the option of swapping your standard tub or shower for a curbless walk-in shower. Luxury – With a $25,000 budget, you can move plumbing fixtures in order to optimize the space for comfort, and you can invest in high-end flooring and countertop materials. You can get custom-made cabinetry, exotic tiling material installations, radiant heating for your floor, and a luxury shower When calculating remodeling costs on the luxury end it’s highly advised you create a set of remodeling plans and a detailed list of materials or this remodel can get out of control. If your finished basement isn’t stuffed to the ceiling as a storage space, why not remodel it to add usable square footage? On average, people are paying $10,000 to $30,000 for this type of remodeling project. Modest – With a basement that is 500 to 800 square feet, you can create a family room, home theater, or a man cave for around $6,000. Keep your costs down with low-cost materials and furniture and don’t go overboard on a home theater system. Average – With $20,000, you can remodel a basement of 700 to 1,200 square feet. You can use higher-end flooring materials, add cabinetry and storage, and frame the basement to add rooms or separate spaces. You can even have a bathroom installed, though it will cost $10,000-$15,000 for the plumbing, electrical, fixtures and walls. Always remember that calculating remodeling costs will depend on the amount of square footage you use for the remodel. Luxury – A budget of over $30,000 can transform the basement into a very comfortable and stylish living space, with bedrooms, bathrooms, closets, a kitchenette, cabinetry and high-end flooring materials. A garage remodel can be one of the less significant remodeling budgets. Think of what you could use more of—bedrooms, family areas, work space—and see if it will fit. On average, homeowners spend $5,000 to $18,000 on this remodeling project. Modest – With $3,000, you can whip your garage into shape with storage solutions and paint. This remodel is for homeowners who still want to store their cars in the garage, but who want the space to be more attractive and functional. Average – If your budget ranges within $5,000 and $10,000, you can really transform the garage into an office or family entertainment room. A drop ceiling will cost around $1,500; adding more electrical outlets ranges from $150 to $500; drywall will be around $1,000; and flooring could be $1,000 or more. Luxury – You could turn that old garage into a guesthouse with $20,000 or more. For this, you would need to install plumbing and electricity, drywall, flooring, a kitchenette and a bathroom. This entry was posted on February 6, 2019 by Home Pro News.